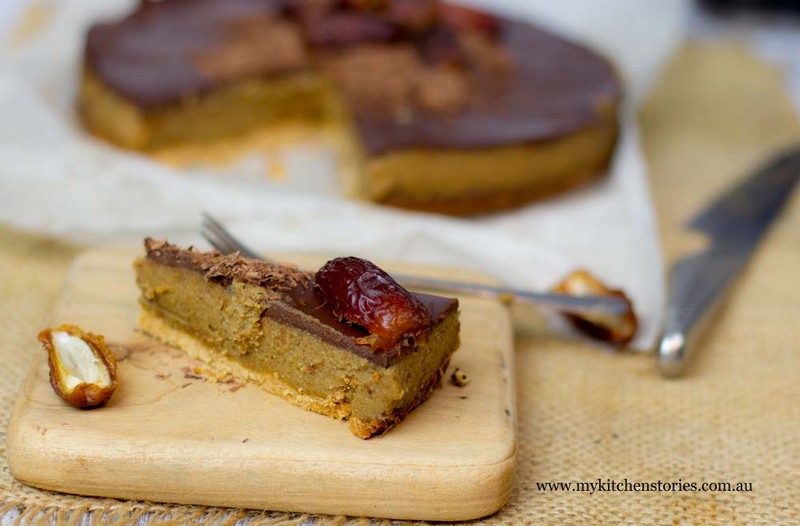 I made this Gluten Free Date, Caramel, Chocolate Tart especially for you. Yes you, that really can’t fathom coconut butter and no sugar and no eggs. 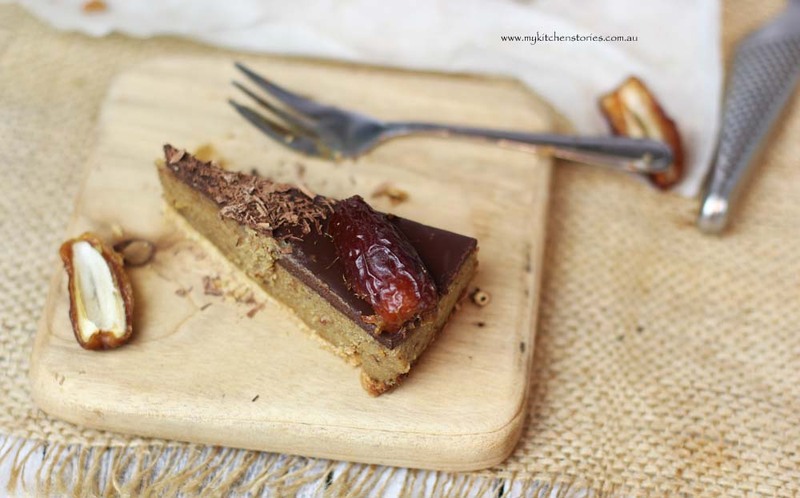 You want gluten free and you want that caramel that everyone is talking about….you know the one that’s made of dates and cashews?. This is it. You will be able to make this in no time at all and you don’t need anything too fancy to do it except a blender. It is a caramel that doesn’t need any cooking over a high heat, no smoke and the possibility of burns, but you really do need a blender. Without a blender you won’t get the very creamy smooth texture of the caramel. I started to get a little worried a while ago. The world seemed to be going nuts with vegan and gluten free cooking and I was not prepared. Would I ever learn to make cakes and slices using coconut butter, fusing without dairy and eggs and would I want to? I felt like my years of experience with baking would be wasted. Would anyone still be interested in the cakes I can make or the pastries I can cook?. I got a bit lost for a while. I really love baking. I love the science I know, I don’t have to think about it, it’s like magic. But there is a place in my life for new ingredients and techniques, and I am learning. I am not so fond of coconut butter, it’s not a flavour I like, but I have now taught myself to make caramel from dates and creamy fillings from nuts and even meringue without egg. This is a very simple version of a slice I made a couple of months ago. This is far more basic and uses a gluten free rice cookies as the base for the tart shell. That means it is even quicker and easier, but I promise you will love it. This recipe contains dairy but please replace it with coconut butter if you want a dairy free version. This has little sugar and no eggs and you will not miss them, you will not care. 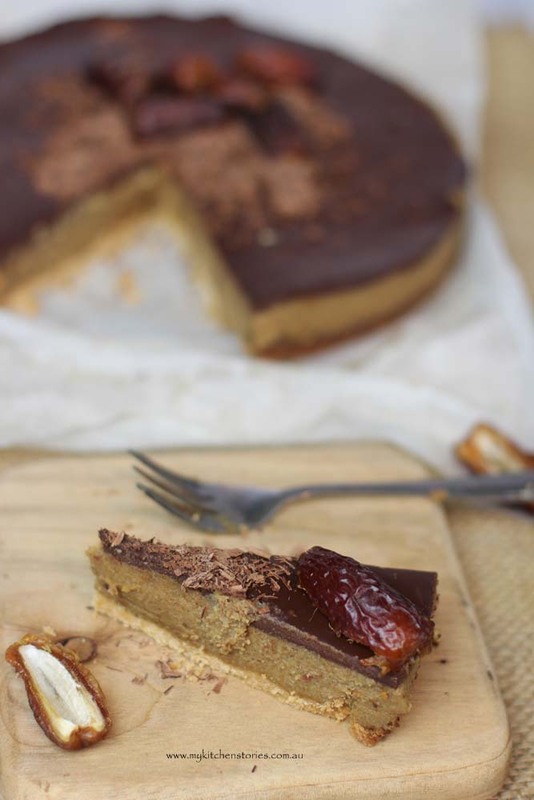 The guinea pigs that tried this caramel tart sensed it had a slightly different taste but they all loved it…..completely. Give it a try and let me know. Pop this into the pre- heated oven and back for 12-15 minutes or until just starting to brown. Set aside to cool. Refrigerate to set. Put the dates with enough water to just cover (3/4 cup) and simmer till they are a nice soft purée, stirring every couple of minutes braking up, then put the dates into a blender with the cashews, maple syrup, vanilla and melted butter. Start to blend. It will be very thick so add 1/4 cup of water and blend again, scrapping down the sides. You will soon have a very smooth caramel tasting purée. Put the cream into a jug and heat till just under boiling. Add the chopped chocolate to the cream and stir till thick and smooth. Spread over the top of the tart with a palette knife till nice and smooth. Decorate with grated chocolate and dates. keep refrigerated. 400 grams of dates..this is going to be a calorie bomb..but it definitely looks worth all of the calories! Yes but if you used sugar and butter and cream it would be even more of a calorie bomb minus the fibre, Angie! 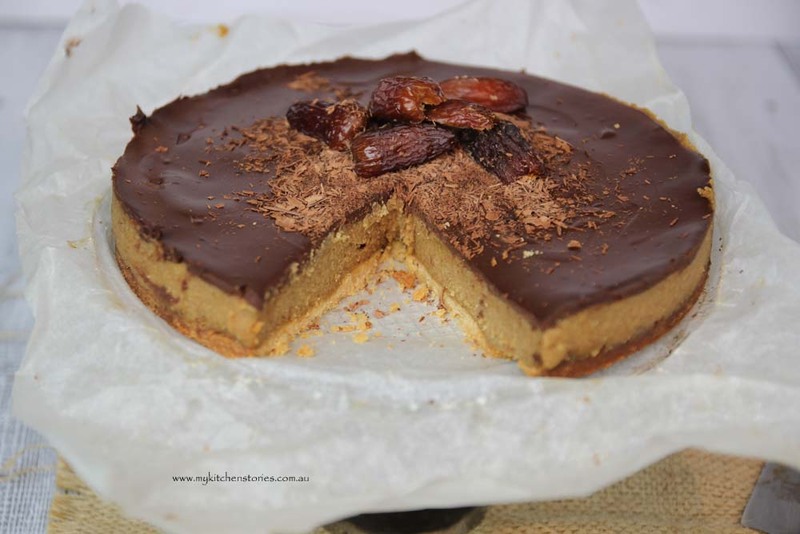 I’ve made a similar slice but mine was raw-they’re so easy. The only thing I miss is having the oven on for warmth but yours uses it so I may have to try it! Yep it’s a pretty popular thing to make right now, but delicious! It looks like you’ve embraced the new era of cooking just fine 😀 This looks delicious! Yes, I do want this date caramel! I’m actually super into dates lately so this sounds like the perfect way to keep that celebration going. Look out Mexici you are in for caramel Tart! lol it does feel like everything is going gluten-free these days. I’d happily eat a slice of this, though! 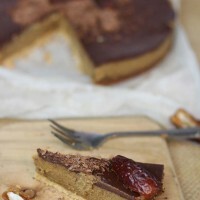 I just discovered your blog and love the look of your recipes and your pics are fantastic!